Bonjour! We couldn't be happier to announce a new Google Analytics blog for all you francophiles - le blog officiel de Google Analytics (en français)! This is a companion blog to this English blog and it will be linked to from our French homepage, via the "Blog" link. Take a look to read the very first post! The French blog will have translated and localized versions of important posts from this blog, such as feature launches and integrations. There will also be practitioner posts and announcements, such as case studies from the French-speaking market and techniques for analyzing data that might be specific to the online industry in France or other French speaking countries. It will also be a place to find out about French analytics events that are happening. And it will not just be localized towards the French-speaking markets - it will be a good read for everything Google Analytics, written in French. Google Analytics managers Nat Criou and Serge Descombes will be your chief correspondents on the blog, and there will also be contributions from French-speaking experts. Nous espérons que vous apprécierez! in October, we created a few short videos to help people get started using the features. Your feedback on these videos and their popularity (over 70,000 views so far) has inspired us to create more educational videos. We'll continue to listen for what you want to learn about and work on adding useful videos to the channel. If you want to be sure that you always stay up to date, you can subscribe to the Google Analytics Channel or even add an iGoogle gadget to your homepage. When we launched additional enterprise class features in October, we created a few short videos to help people get started using the features. Your feedback on these videos and their popularity (over 70,000 views so far) has inspired us to create more educational videos. Seminars for Success have been so popular in the US that we're now expanding to Canada! Come join one of our lead instructors, Justin Cutroni, Director of Analytics at EpikOne for a Google Analytics Seminars for Success in Montreal December 8 - 9. Whether you are an analyst or tasked with configuring Google Analytics this seminar will help improve your overall understanding of Google Analytics. Perhaps you have questions like, "What reports should I be looking at for my business and what do they mean? How do I configure goals? 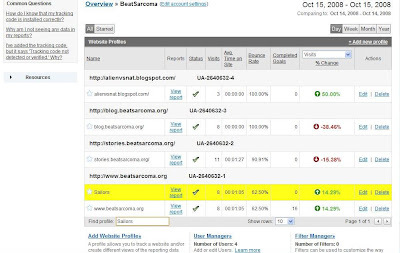 What is an acceptable bounce rate?" If so, then Seminars for Success Montreal is for you. For only $249 U.S. per day this seminar offers tremendous value. Day 1 focuses on Google Analytics reports and data. Justin walks through almost every report and shows how you can use Google Analytics to gain meaningful data insights. Day 1 will also cover many of the new Google Analytics analysis tools including Advanced Segmentation, Custom Reports and Motion Charts. On Day 2 Justin really digs into how Google Analytics works and how to configure it correctly. Ready to learn how you can improve your Google Analytics skills? Register here!